The biggest threat to Who’s continuing success is that some of its tropes become over-familiar, and while ATMOS is a neat idea, it does instantly recall similar schemes: the Archangel network in “The Sound of Drums”; the earpods in “Rise of the Cybermen”... Still, perhaps this is the kind of thing that fans notice, and casual viewers don’t. Like “Daleks in Manhattan”, this is a script that joins the dots without making any radical imaginative leaps. But it still works, largely cos it delivers a massive, grin-inducing hit of nostalgia. 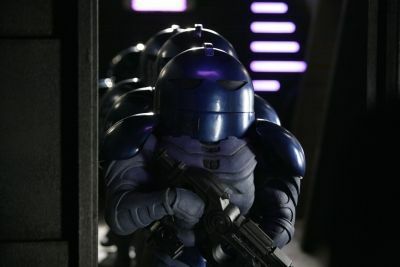 It’s great to see UNIT back en masse, and the same is true of the Sontarans. Neill Gorton’s prosthetics look magnificent, and the script nails the shortarse spudheads’ slightly comic singlemindedness without diminishing them to the level of mere figures of fun. The emergence of the half-formed human body from the cloning tank: wonderfully macabre and sure to permeate thousands of children’s nightmares. I wish Bernard Cribbins was my grandad. Perhaps he would be willing to adopt? The script winkingly acknowledges fandom’s “UNIT dating controversy” (the old show’s continuity is inconsistent on when the Third Doctor’s earthbound adventures were set) by saying he worked for UNIT “in the ‘70s... or was it the ‘80s?” . And the “weak thorax” line is a nod to 1973’s “The Time Warrior”. So, what are the Sontarans up to? Well, since Rattigan’s lab contained experiments to do with terraforming, I’m guessing that the gas isn’t poisonous, and is part of a scheme to make Earth more suitable for Sontaran habitation? Although they don’t seem to have any major problems breathing in the air... Maybe they’re going to turn the planet into one massive cloning pool? “400 million cars” has to be the daftest of all the “things that can deadlock-sealed” yet! (Are even the windows deadlock-sealed?!) And it takes an age for Donna’s grandad to conk out. Has he got a respiratory bypass system?